Remember you are working with hot sugar so be sure to have a bowl of cold water ready in case you get any of it on your skin. 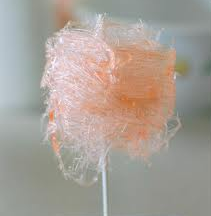 It is best to make sugar on a dry day, as the humidity will melt the sugar. To make this recipe at home, you will need a pair of wire cutters and an old inexpensive whisk. Cut the round ends off an inexpensive whisk. Arrange the tines so they are evenly spaced. You will also need an open space to make the cotton candy. At home, slit open a garbage bag and cover the floor area. Wedge 2 long wooden spoons under something heavy so they extend off the edge of the counter. Place the sugar, corn syrup, and water in a 2-quart heavy-bottomed saucepan over medium-high heat. Insert a candy thermometer and cook the sugar mixture until it reaches 320 degrees F, what is known as the hard crack stage (the sugar becomes brittle when it comes in contact with a cooler surface). Remove from the heat and carefully pour into a medium-size microwaveable glass bowl. If you leave the sugar in the pan, the sugar will continue to cook and turn dark brown. A glass bowl will hold the temperature of the sugar. If you are going to color and/or flavor the sugar, add those drops now. Dip the tines into the hot sugar. Allow the sugar todrain off for 1 to 2 seconds until the draining sugar strands are relatively the same consistency. Then wave the whisk over the extended wooden spoons and allow the sugar strands to gently drift until they are resting on top of the spoons. Make sure you are about 12 to 18 inches above the spoons. Use broad long strokes and work quickly. Gather the cotton candy and roll onto paper that you've rolled into a long, thin cone, likecotton candy is served in at the carnival or serve as is. If you need to store the cotton candy for a few hours, place it in an airtight container. The delicate sugar will melt in a humid environment.